Author L C Beck’s newly released “BRD Finds a Home” is a children’s book about faith and a little orange kitty. 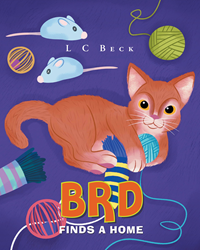 “BRD Finds a Home” from Christian Faith Publishing author L C Beck is the story of a cat named Copperfield, known as Big Red Dude to his brothers. His undying faith will help him find love and a family of his own. “BRD Finds a Home”: a story about a cat that relied on his undying faith to make his dreams come true. “BRD Finds a Home” is the creation of published author, L C Beck. Published by Christian Faith Publishing, L C Beck’s new book is a tale of the love and friendship that everyone can have. “BRD Finds a Home” is the story of a big orange cat named Copperfield, known as Big Red Dude to his brothers. After a long and scary journey that starts at an animal shelter, BRD will find a new home and the love of a family. To make his dreams come true, however, he must rely on faith. View a synopsis of “BRD Finds a Home” on YouTube. Consumers can purchase“BRD Finds a Home” at traditional brick & mortar bookstores, or online at Amazon.com, Apple iTunes store, Kobo or Barnes and Noble. For additional information or inquiries about “BRD Finds a Home”, contact the Christian Faith Publishing media department at 866-554-0919.